Fire Records Original Release Notes: Robert Pollard isn't a man to rest on his musical laurels. 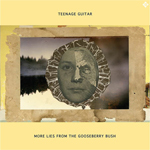 The acclaimed Guided By Voices frontman doesn't just create solo records (released under the not so surprising name Robert Pollard), he goes further into the fold of solo, writing and playing and recording everything you hear under the name Teenage Guitar. The second such recording to fall into the solo works of Bob arrives in the form of 'More Lies from the Gooseberry Bush'. A fifteen track whirlwind of fuzz pop mastery. Fire's exclusive 2CD release also includes the complete debut album, 'Force Fields At Home' complete with accompanying booklet to bring you right up to date with the latest from Robert Pollard. (Please note this last sentence may itself be long out of date by the time you read this).